Previewed this week at the Agenda Show Long Beach, Vans previews an upcoming addition to its Spring/Summer 2014 Classic footwear range. 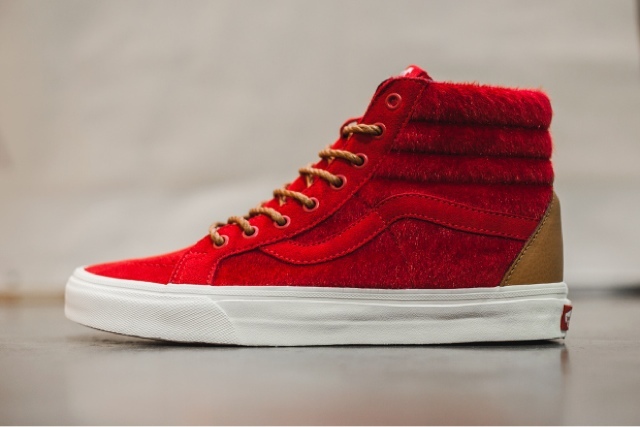 Culling its design and name from 2014′s “Year of the Horse,” the thematic Sk8-Hi Reissue iteration is mocked up in a “Chili Pepper” red pony hair upper with tonal red suede throughout. Hits of contrasting tan leather make a statement in the lower leather heel hit as well as the braided leather laces. Everything is finished off with a pure white vulcanized outsole and waffle sole. Expect these to hit select Vans Classic stockists as soon as the new year hits.